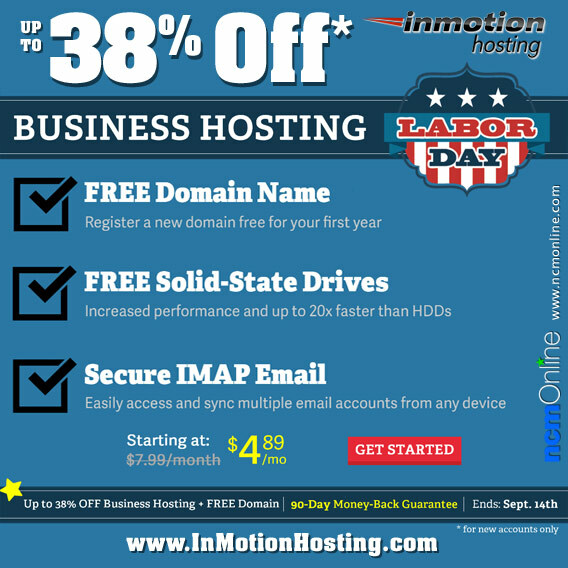 Current Discount (up to 38% off business hosting plans): No promo code required. InMotion Flash Sale! New accounts get up to 38% off Launch, Power, and Pro Business Web Hosting packages. Free domain name: Register a new domain free for your first year. Free solid-state drives: Increased performance and up to 20x faster than HDDs. Secure IMAP e-mail: Easily access and sync multiple e-mail accounts from any device. The Best Guarantee: All plans include a 90-day money-back guarantee. Launch Plan currently $7.99 per month — with discount only $4.89 per month (38% off). Power Plan currently $9.99 per month — with discount only $6.29 per month (37% off). Pro Plan currently $15.99 per month — with discount only $10.49 per month (34% off). Note that discounted plans renew at the regular rate. Select a longer billing cycle to maximize your savings. Promotional discounts valid on new accounts only and cannot be applied towards renewal invoices. Certain elements of this page: ©2015 InMotion Hosting. All Rights Reserved.